Set in the year 2029 – I’ll never understand why anyone makes futuristic films set only a few years ahead *cough*Predator 2*cough* – this sees Logan down and out, making ends meet as a limo driver whilst looking after the ailing Professor Xavier. When someone approaches him seeking aid, he’s forced to get the claws out one last time. A sense of finality hangs over proceedings, even if we hadn’t had Jackman’s insistence that this is his last appearance as Logan after a 17-year run. And for the most part, it works. He’s beaten and bruised, and his healing skills aren’t what they used to be. The MA rating also means that this is our X-Man as we’ve never seen him before. I’m not one that’s been clamouring to see an ultra-violent version of Wolverine, but it just makes sense, doesn’t it? If you’ve got knives coming out of your knuckles and you like to punch people, you’re bound to do some damage. 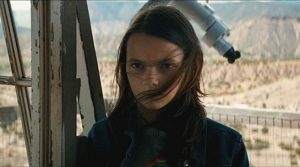 So, be warned, parents: Logan is a very, very gory film. We’ve come a long way since Brian Singer arguably made superhero movies viable with 2000’s X-Men, so it’s good to see a film that finally shakes up the formula for Fox. The increased rating not only means we get violence and naughty words, but it also means the script can talk to us as adults. We don’t get ridiculous exposition scenes, we don’t have important plot points reiterated time and again. There were even some subplots I completely missed and have only since discovered online; this is a great change from the usual superhero cinema experience. Deadpool may have got mad props for its comedic and self-referential take on the genre, but underneath was quite conventional. Jackman is excellent, but he always has been, even through all those dodgy films. Patrick Stewart is reliably great too, showing us a much more insecure and frail professor. The duo feel reinvigorated by their change in circumstances. Newcomer Daphne Keen is brilliant, and you can bet that Fox have her in mind for any future films. Stephen Merchant also sinks his teeth into playing Caliban, a turn that will hopefully see him move away from purely comedic roles. Marco Beltrami’s score is fantastic. The fact that he previously specialised in horror films is put to good use here, and if anything his harsh, industrial work reminded me of Brad Fiedel’s Terminator scores. If, like me, you still haven’t got around to seeing X-Men: Apocalypse, don’t worry about doing your homework beforehand. Logan only really references events from the first X-Men film, and as always with Fox’s franchise, the timeline is a mess anyway. If they’re not going to worry about continuity, why should we worry about seeing all the films in the proper order? 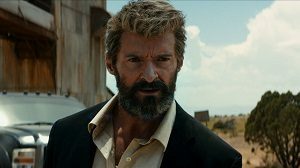 Logan is a definite high point for X-Men, and a great send-off for Jackman’s take on the character. If you’ve drifted away from the franchise, this one’s worth a look if for nothing other than the sheer conviction behind it. My only criticisms would include the dearth of female characters – even in 2017, the few actresses present are either innocents or murder victims – and the fact that the journey is much more enjoyable than the destination. But this is still an impressive comic book movie.